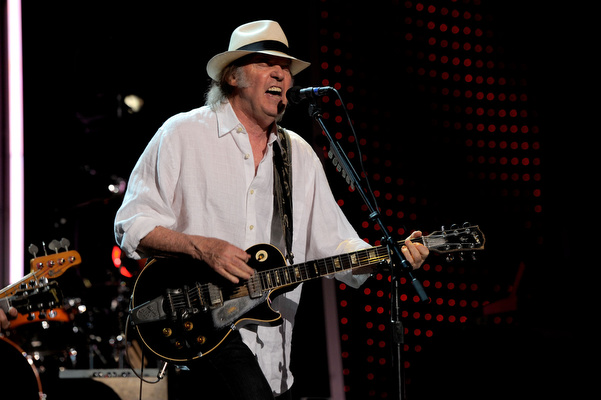 Neil Young News: "If Bob Dylan is an icon, Neil Young is a category." An amusing article on aging rockers, from Neil Young to Bono. It’s hard to see grace in the FrankenNeil hair or in some spotty recent work, but impossible to miss it in his devotion to songcraft, and volume. If Bob Dylan is an icon, Neil Young is a category. And Neil is a family man who quietly set up a venerated foundation for his disabled kid, now celebrated by half of the rock world order, champions young bands, and still plays so loudly that rumour has it his guitar tech won’t go onstage during a song. More commentary on Rockers aging gracefully and not so gracefully, from Neil Young to Bono. Also, see more on "If Bob Dylan is an icon, Neil Young is a category." I love Neil Young. Always have and always will. "FrankenNeil hair"? "Spotty recent work"? Faintly damning praise from Mr. pseudonym "Bono"... At least NY never rocked a damn awful mullet haircut! And as myself who once did like the music of U2 a great deal, this jet-set wannabe messiah has NO account to criticise NY's so-called "spotty recent work". And as far as I know, his band has never played The Bridge School Benefit Concerts. Ever. And worst of all-- Pretending he is royalty enough to be stow the honor of "knighthood upon NEIL PERCIVAL YOUNG? "Bono" needs to shut the f*ck up. on an unrelated note....I was hoping we would have a Crazy Horse album release date or some tour dates by now. Neil Young's work just keeps getting better. His last disc "Le Noise" is the sound of an artist still at his peak. I mean, the dude just does not sell out to schlock. Even though his fame would give him license to do so. Neil knows this but yet he goes the pure artist route ~ feed the muse and she will reward you with new, vibrant and creative stuff. It takes work. This is why everyone I talk to from casual fan to devotee regards Neil with utmost respect. I'm proud to say I'm from Canada, Neil Young's homeland. And Bob is recording a new album too. There's Bob and Paul and Neil, and then there is everyone else. Try somehow to imagine the last fifty years without these guys. How about imagine without even one of them. Or with only one of them. I sure can't. In a world where everything is forever changing, we've had these three to give us an anchor. To show us our world and rock our asses off. Giving us the songs that we live our lives with, that we love our lives with. That we say hello and goodbye with. How many people have listened to how many of their songs over the past fifty years? Even more will be listening over the next fifty. And the next fifty. So let's all enjoy and be thankful for what they have given us. And for everything they continue giving. The full moon can be wonderful on a clear and quiet night. and John, lest we forget. @Eric - easy now. Your anger can be directed to the article author MARK LEPAGE. @asg: Thanks. Funny how every time we run something with both Bob & Neil it eventually degenerates into this? Weird. So, what would Bob do? @BSM - TW a fanatic fan site?! No, we're just passionate. Bob is an icon. Neil is iconic. Got it? U2 is a genre of Irish contemporary rock music. Paul should have told the Queen to stick it up her rear end and give Ireland back to the Irish once and for all. Paul sold out. John & George would have never ever sold their soul the way Paul sells his. Why doesn't the USA give Hawai back to the Hawaiians! Things aren't always as simple as they seem MNOTR. I categorically con you not, this is where it all started! I did not forget John, who was, is and will always be my favorite. My point was simply that these three survivors are not only at the head-of-the-class, they are the flag bearers for everything good that continues on in music. And with almost 150 years of combined music, I don't think we've ever seen anything like this before. And we probably won't see it ever again. Asked the lord above "Have mercy now save poor Bob if you please"